Most consumers who find themselves stuck with a lemon car that was purchased new find themselves paralyzed when trying to figure out what to do with a car that routinely has problems. When the consumer brings the vehicle into the service center, the service representative is always cooperative and cordial, but at the end of the day, the car still has problems after the 3rd or 4th visit. When the consumer contacts the car manufacturer, they are assigned a case manager who provides no solution to the consumer — a lot of times, the consumer is led to run around in circles. This is the situation that my recent client from Alpine, Texas found himself in. At first when I spoke with this client, he was very frustrated with the predicament that Chrysler put him through. 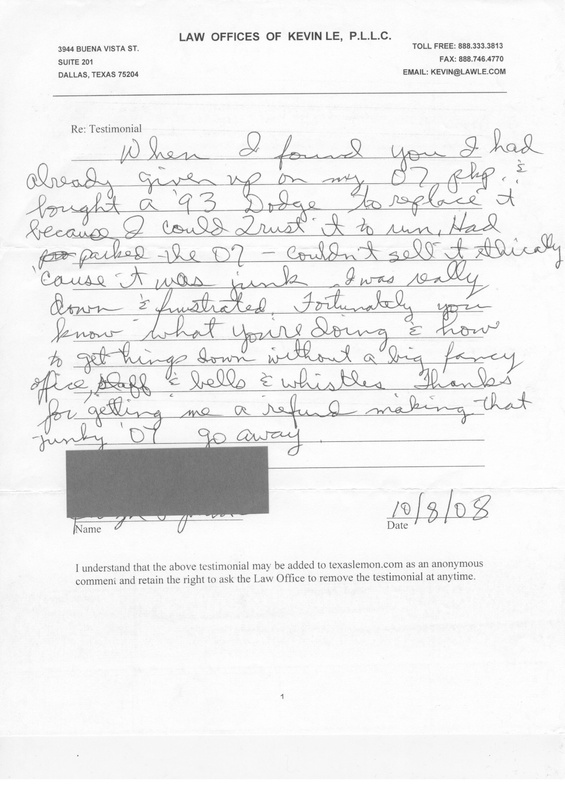 I started working on this client’s case after he submitted documents to my office, after we discussed his options, and after he signed the representation agreement with my office in early May 2008. When I first accepted this client’s case, I was confident that he had a lemon and I was focused on helping him get out of his lemon truck. After jumping through various hurdles with the opposing side, we were able to get this client a repurchase on his vehicle. All in all, a success in my book… here is the client’s testimonial.